Just about everybody has a box of seashells they've picked up from a beach somewhere. I enjoy using them in my collages as a memento of a great vacation. These shells came from a trip to Florida when my children were small. Decorative papers make up the colored background, with a piece of my handmade paper superimposed on top. 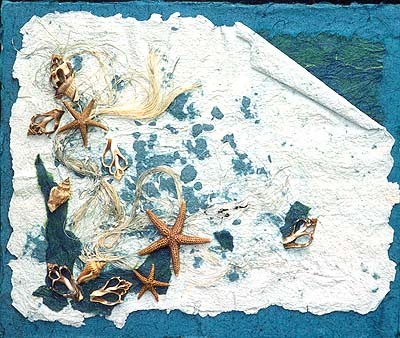 The colored papers were adhered with soft gel, the handmade paper and shells with regular gel. Try it for yourself--do my project on nature collage.